:: Miramar 摩天輪 :: What goes up Must come down. Shiny iron… - Dreams are what you wake up from. It was a 17 minute ride. familiar lj nick; who's this? hello, i dont think u know me.. was just passing by. maybe u read my comments in common friends? 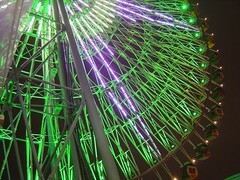 There're large ferris wheels and small ferris whells though. hm ... hopefully i can get a good shot with my cam too. What rises, ceases -- that is, if like me, you buy into Buddhist thought. heheh. I just read your LJ, didn't know there's so many... errmmm, for the sake of being diplomatic, "less-than-desirable" characters. It takes all to make a world! Agreed. I'm the intentional lj hermit. The fact that nothing lasts forever can be a beautiful thought in itself.